Through research into global health during our Medicine degree at UCL, we were constantly faced with shocking statistics. For example, did you know that at least 50% of the world’s population do not have access to essential health services? Yet, there are more mobile phones than people in this world. So, we asked ourselves, if most of the world’s population has access to SMS technology, can we leverage this to deliver a simple and accessible service? The concept is simple: Beba leverages SMS technology to provide digital healthcare, beyond the hospital, to mothers and children in resource-poor settings. Using natural language processing via an intuitive chat interface, Beba extends the reach of essential healthcare by using software to enable clinicians to ‘on-board’ mothers during their first antenatal care visit. Once mothers are signed up, they can use our service to address their various healthcare needs. For example, mothers can retrieve their healthcare records, request or change appointments and receive tailored health advice via SMS. Beba will also send vaccination reminders and milestone checks for her baby. Should red flag symptoms be identified, appointment booking suggestions are sent to mothers to enable immediate contact with the relevant healthcare provider. Quality of care increases while the burden of work for clinicians decreases. Research has shown that SMS reminders help increase the rate of medication adherence (Montes et al., 2012), non-medication treatment adherence (Balato et al., 2013), and vaccination coverage (Stockwell et al., 2014). As proposed in the ‘transtheoretical model of behaviour change’, these reminders can serve as cues to help facilitate behaviour change and improve health outcomes (Prochaska et al., 1994). 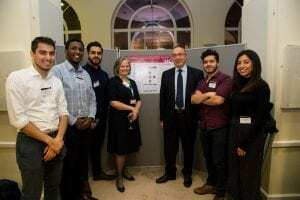 We were extremely honoured to present our company at UCL’s annual ‘Celebrating Global Engagement’ event, welcoming kind words from various senior UCL staff members including our very own Provost and President, Michael Arthur. Our solution has many benefits to society. We work to strengthen existing healthcare infrastructure and improve the health of both newborns and mothers alike. Through our vaccination reminders, Beba improves the health of a society. Vaccines are essential in reducing and maintaining a low burden of communicable diseases. Prevention of diseases is key and has financial benefits: for every $1 invested in child health, the state recoups $13 over their lifetime. The most exciting news is that we have partnered up with the charity Maternal Aid Association (Maa), and will be launching our service this summer in Bangladesh. We believe this is just the beginning of our journey in transforming healthcare for mothers and children across the globe.